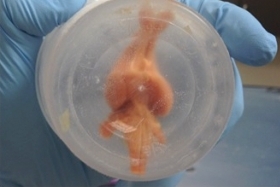 A mammal brain has been defrosted from cryogenic storage in an almost perfect state for the first time. This breakthrough, accomplished using a rabbit brain, brings us one – albeit tiny – step closer to the prospect of reanimating a human brain that has been cryogenically preserved. After death, organs begin to decay, but we can delay this by cooling these tissues, just like freezing food. But in the same way that a frozen strawberry becomes soggy when defrosted, it is difficult to perfectly preserve mammals at cold temperatures. We, and strawberries, contain large amounts of water, which freezes into ice crystals that damage cells. Cryoprotectants can prevent this ice damage, working like medical-grade antifreezes and preventing organs from freezing. This works in small worms and rabbit kidneys, but it needs to be administered quickly, which usually causes brains to dehydrate and shrink. Now, Gregory Fahy and Robert McIntyre at the company 21st Century Medicine in Fontana, California, have developed a technique that appears to prevent dehydration and preserves the brain in a near-perfect state. By draining the blood immediately and replacing it with a chemical fixative called glutaraldehyde, they can instantly stop decay, allowing them to add cryoprotectants more slowly to prevent dehydration. The brain is then cooled to -135 °C, which turns it into a glass-like state that can be stored for centuries without decay. When they tried this technique on rabbit brains, thawing them up to a week later, Fahy and McIntyre say the preservation appeared “uniformly excellent” when examined using electron microscopy. They have been awarded a US$26,735 prize by the Brain Preservation Foundation for the technique. Looking at slices of these brains, they saw that the individual connections between neurons remained intact. Such connections, known as the connectome, are thought to be vital for preserving personality and memory. A team at the Alcor Life Extension Foundation in Scottsdale, Arizona, showed last year that defrosted worms retained food-associated memories if their connectomes were well preserved. Hayworth says the research completely refutes past suggestions that cryonics won’t work because it’s impossible to preserve the synapses between neurons that store memories. One limitation of the technique is that the glutaraldehyde used to chemically fix the brain is a deadly chemical, says Joao Pedro Magalhaes at the University of Liverpool, UK, who coordinates the UK Cryonics and Cryopreservation Research Network. This means reviving a brain preserved in this way may not be possible, although some scientists believe nanotechnology may help overcome this hurdle, he says. Although cryopreservation techniques have not yet been perfected, more than 100 people worldwide have already been cryogenically frozen after death by companies like Alcor.